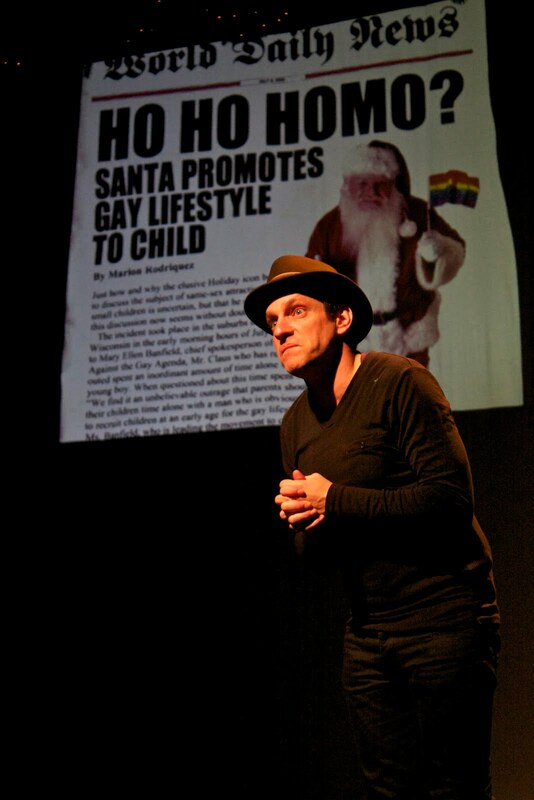 Jeffrey Solomon’s play, Santa Claus Is Coming Out, is currently being presented as part of the SoloNOVA Festival. This acclaimed one-man mock-u-mentary explores the secret romantic life of the great holiday icon and the controversy that engulfs the world when the truth is revealed. When a little boy’s gender atypical gift request to the North Pole is denied, a series of heart-felt letters from the child nudge Santa Claus out of the closet and into the culture wars. A theatrical documentarian in the mold of Anna Deveare Smith and the Laramie Project, Mr. Solomon purports to have interviewed, and portrays, all of the key players in the scandal that has come to be known as ‘Santa-Gate’. Solomon's other solo play Mother/SON has been seen at HERE (NY), Celebration Theatre (L.A.), and he received a Joseph Jefferson Nomination for Best Actor for the same performance in Chicago at the Bailiwick Rep. Internationally, Mother/SON has been seen on London’s Off West End at the New End and Oval House Theatres, the Edinburgh Fringe, Homotopia in Liverpool, the Leeds International Jewish Performing Arts Festival, and the 4th Floor (Mumbai, India). His performance won the Best Actor Award in Dublin’s Absolut Gay Theatre Festival as well as the Awards for Audience Favorite, Best Playwriting and Best Male Solo Performer at the Columbus National Gay and Lesbian Theatre Festival. Santa Claus is Coming Out won the Best of the Fest at the same festival. The play had its premiere at the Bailiwick Pride Series in Chicago. I cut my teeth in the 80’s working Off Off Broadway with Robert Patrick’s Blue is For Boys and was a founding member of CityKids Repertory Company where I worked with Diane Houston, the first African-American woman to be nominated for a Directing Oscar. I developed there a passion for creating theater that was engaged with issues… had a fire in its belly, but was never didactic or preachy. I saw Anna Deveare’s Fires in the Mirror at the Public Theatre in the early 90’s and was completely blown away and inspired. I had a similar response to John Leguizomo’s first solo show Mambo Mouth. It seemed to me that with so much of the theater audience being diminished by television and films, here was one experience that only theater could provide: One gifted actor/story-telling engaging the audience’s imagination and taking them on an unforgettable ride. Television and movies can do a lot of things, but the solo play done well is unforgettable and something that is uniquely theatrical. Santa Claus Is Coming Out imagines how the world would react if the great holiday icon were revealed to be a gay man. The program will inform you that the play is crafted from three years of interviews I conducted at the North Pole and beyond, about the scandal that has become to be known as "Santa-Gate." If you missed the run on Theatre Row in 09, now is your chance to catch the show the NY Times calls a "Delightful Surprise!" If you didn't know the true story of Santa Claus, here it is in a nutshell: Mrs. Claus is just a beard, a third rate actress hired by Santa’s agent to protect the Coca Cola image. Santa Claus’s true love is Giovanni Geppetto, a strapping Italian toymaker, the great-great-great-great grandson of Pinocchio. The religious right, convinced that Claus has become a tool in the Gay Agenda’s attempt to recruit children into the homosexual lifestyle, is preparing a sweeping propaganda offensive against the great holiday icon that may end Christmas as we know it. I choose Candi Cushman, the so-called “education analyst” from the group “Focus on the Family.” In her blog, Ms. Cushman attacked my play along with a chorus of other right-wing voices including Fox News, when it ran Off Broadway in 2009 and accused me personally of perverting the innocence of Christmas and "using shock tactics to expose children to homosexuality." I laughed long and hard about this because Ms. Cushman’s lines seemed to have come directly from the mouth of my play’s antagonist Mary Ellen Banfield, chief Santa Claus foe and president of the fictitious group Families Against the Gay Agenda (F.A.G.A.) My fantasy is that watching my play would cause Ms. Cushman’s heart to “grow three full sizes” in a Grinch-like redemption, but more likely Candi and Mary Ellen could have a strategy session on how they can better facilitate the likelihood of gay kids jumping off bridges in the coming year. A Spanish translation of my actual documentary play DE NOVO will be performed in El Salvador in June (see http://www.housesonthemoon.org) or you can see the same play, mostly in English in September at the Passage Theatre in Trenton. I am performing with the acclaimed storytelling org The Moth in Michigan this June as well. In October “Mother/SON” will be travelling to Greece.